Many times in life we are faced with things we’ve never had to deal with before. When we face an entirely new job, we are dealt with encounters we’ve never dealt with before. Or maybe having the same job for many years, we are dealt with someone or something that was never in our protocol. 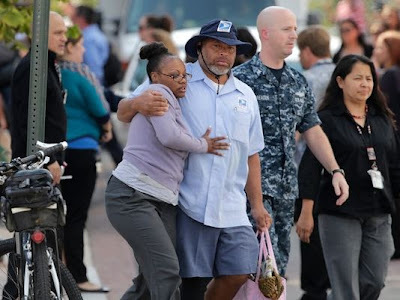 12 people dying today at Navy Yard is in no one’s protocol, especially for those who work on the base, and most depressing, for the family members who lost loved ones today. It is really difficult to deal with messes like these, trying to make sense of it all, and I’m starting to believe… maybe we’re not called to try to figure things out right away, but to bring it to God and let Him deal with it. and pray to God to figure out this mess for us. Today we pray for those affected by this tragedy. But most of all, we pray for our hearts to lift all things that we are just not ready for or not sure to deal with, especially dark difficult things like this. We lift it all to God, to Jesus. It's a good start Matt. But something has to be done about the access to guns in this country. It's just plain crazy. Thank you for your opinion, Fray!